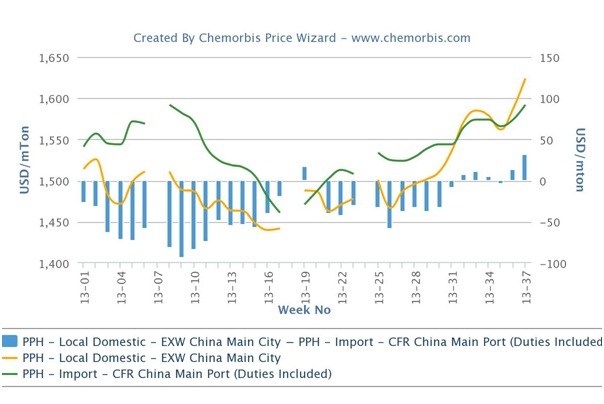 China’s local PP market had been trading below the landed costs of imports since the beginning of 2013, although locally held and domestic cargoes should normally carry a premium over imports as per the pricing service of ChemOrbis. 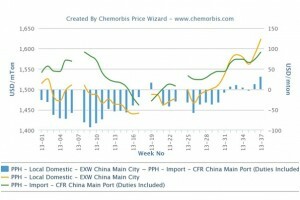 In recent weeks, the local market has moved up and regained its premium over imports after a long period. The local market was trading below the import market level all this time mostly because of poor demand, with domestic producers and local resellers offering more competitive options to buyers against import cargoes. What triggered the latest gains in the local market were mostly the soaring energy markets as crude oil on the NYMEX breached above the $110/bbl threshold earlier in the week before losing ground in the following days. The lack of inventory pressure on the producers’ side was also blamed for the consecutive weekly gains. “We received prices from a domestic producer with CNY100-150/ton ($16-25/ton) increases on the back of stronger energy markets. We do not have any materials now as we had sold out our stocks last week in anticipation that prices would stabilize following last week’s hikes. We are not so confident that further price hikes are achievable in the near term,” a distributor based in Beijing reported.